There are many types of cloth diapers on the market today. 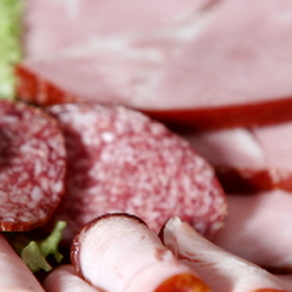 Flats and prefolds are similar to what your grandmother may have used. They are just flat rectangular pieces of cloth that you fold and fasten together with pins or fasteners; or you can just place them folded like a newspaper inside of a diaper cover. Flats are one layer of material and prefolds are multilayered with extra-absorbency in the center. Fitted diapers look a lot like disposable diapers. They are fitted around the legs and fasten together with built-in hook and loops (velcro) or snaps. Contours are similar to fitted diapers, except that they don’t have a built-in fastening system. Flats, prefolds, fitted, and contours all need a separate waterproof cover. 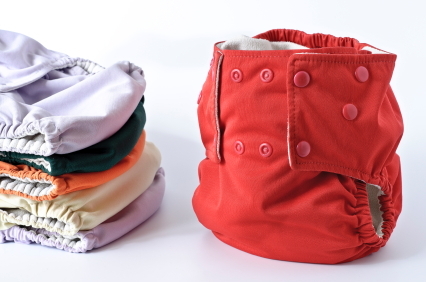 Pockets, all-in-ones, all-in-twos, and hybrids are diapering systems that don’t require a separate cover. They are a little more expensive than other cloth diapers, but they may be more convenient to use. An all-in-one diaper is one unit with a water-proof outer cover and an inner absorbent diaper that fastens together with hook and loops or snaps. Since it’s all one unit, you can use each diaper just once. Pocket diapers and all-in-twos have two parts to them. All-in-twos have a detachable inner layer and pockets have an inner pocket that you fill with a layer of absorbent material. This pocket is handy so that you can customize the absorbency you need; for example, adding extra layers overnight. Hybrids are a combination of disposable diapers and cloth. They have an outer waterproof cover and inside you can place a cloth insert or a disposable or biodegradable insert. Hybrids are an excellent option for moms who want to cloth diaper part time. Finding the right cloth diaper system for your baby may take some trial and error. Cloth diaper systems are not only different in their design, but they also come in a variety of fabrics including bamboo, cotton, microfiber, fleece, velour, and hemp, to name a few. Organic cotton and hemp are popular for fitted diapers and inserts. Bamboo, Sherpa, and velour feel soft and velvety, perfect for keeping your baby’s bottom comfy. 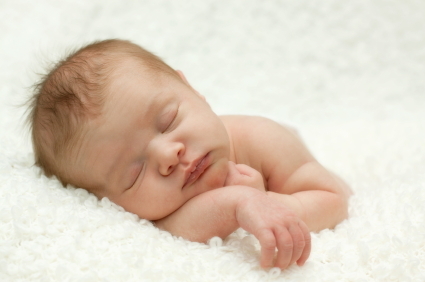 Fleece and wool are breathable fabrics that work great for covers, especially if your baby has sensitive skin. Cloth Diaper Stash: How many should I buy? If you are just starting out, it’s a good idea to dive in slowly. You may be tempted to buy a complete stash of diapers, but it may be better to start off by getting just enough to get you through a day or two of diapering. This will give you a chance to get to know your diapers and make sure they are the right kind for you and your baby. You will use around a dozen diapers a day, depending on your baby’s age. You may want to buy a dozen and a half. This way you can get through one day of diapering, and have a few diapers left over to get through the following day while you’re washing your diapers. If you are using a system with covers, you may be able to reuse the covers a few times, but you’ll still want to have at least a half dozen covers to go with your diapers. Once you get a feel for what you like, you’ll want to invest in around 3 to 4 dozen diapers so that you don’t have to wash diapers every day. Diaper Systems: Can You Mix and Match? When you first start looking at cloth diapers, you may think about getting all of your diapers in one style or brand. If you find a favorite style of diaper, this may work for you, but many cloth diapering moms will tell you that mixing up your stash is the way to go. You may find that one diaper is great for going out in, another is your favorite for around the house, while yet another works best for overnight use. Not only that, but many of the diaper systems are interchangeable. For example, you can mix and match most diaper covers with any brand of prefolds, flats, or even hybrid disposable inserts. Cloth diapering a newborn is a little different than cloth diapering an older baby. Newborns need to be changed more frequently and are so tiny that it makes finding a good-fitting diaper a little more challenging. You can purchase diapers specially made for newborns or you can purchase adjustable one size diapers for your newborn. 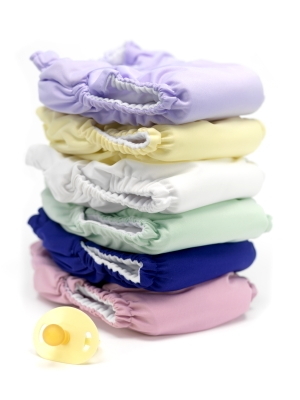 The drawback to buying diapers just for newborns is that they outgrow them quickly; however, many cloth diapering shops offer a cloth diaper rental service for newborn diapers. One-size diapers work well for a lot of moms too. They may be a little big and bulky at first, but as fast as babies grow they should fill them out in a matter of no time. Changing a cloth diaper isn’t a whole lot different than changing a disposable diaper; the only difference is that you don’t throw anything away. When you change a wet diaper, all you need to do is take it off and replace it with a new one. You don’t have to wipe between changes if your baby is just wet, but you may want to wipe her bottom with a wet cloth. If she has a dirty diaper, you’ll still change her diaper pretty much the same way as you would a disposable diaper. Use the diaper to wipe off most of the stool, keeping as much of the stool inside the diaper. When you’re done changing her, just shake the stool into the toilet. Wipe her bottom with a wet cloth or cloth diaper wipe, let her dry, and put on a new diaper. That’s it! Storing Dirty Diapers: What About the Poo? In between washing diapers, you’ll need a place to store your diapers. Most people use a dry pail method. You can also store your diapers in a large wet bag. 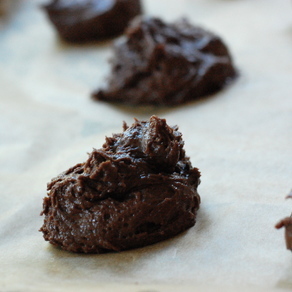 If your baby has a dirty diaper, you’ll want to rinse the poo off before you store it in your pail. You can use a diaper sprayer and spray it into the toilet, or you can just rinse the diaper in the toilet. If your baby is exclusively breastfed you don’t really need to do anything with the poo. You can just toss the soiled diapers in the wash with the rest of your diapers. 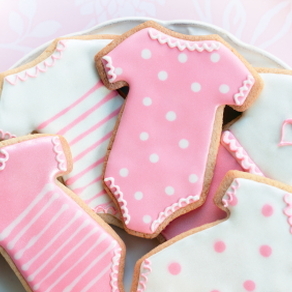 To keep odors down, you can sprinkle a little baking soda on your diapers before tossing them into your pail. 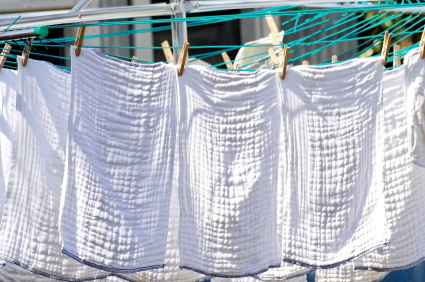 Here is one basic routine for washing cloth diapers. 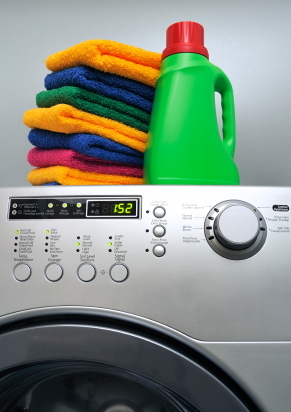 You may want to modify this routine to meet your own laundering needs. Rinse your diapers in the rinse cycle on cold first to remove most of the stool and urine. Then run them through a hot wash/cold rinse cycle with a cloth diaper safe detergent or a detergent that is free of dyes and perfumes. If there is any remaining soap residue, run them through a second hot wash/cold rinse cycle without adding any detergent. Do fill your machine to the highest water level. 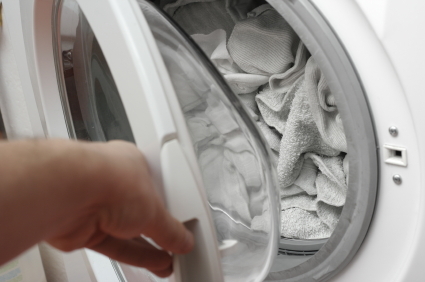 Don’t use fabric softener or dryer sheets as they can damage or build up on your diapers. Do rinse your diapers well. Soap that remains in the diapers may irritate your baby’s skin. Do fasten the laundry tabs on your diapers to keep them from sticking together. Don’t use bleach on your diapers. They can ruin them or irritate your baby’s skin. Do separate inserts from pocket diapers and prefolds from their covers. Don’t use diaper ointments or creams with cloth diapers unless you use a liner to protect the diaper. The right washing routine will keep your diapers smelling fresh and looking their best. Most moms have to do some experimenting to develop a routine that works for them. If you find your diapers are not getting clean, you may need to run your diapers through two wash cycles or use a different detergent. The right detergent makes all the difference. 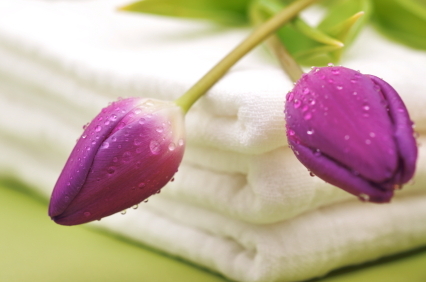 For stains, sun is the best and least expensive way to remove stains. All you need to do is wash and rinse your diapers like you normally would, and then leave them out in the sun to dry. The sun will fade any stains and make your diapers look brighter. JM has experienced cloth diapering moms to answer all your cloth diapering questions. Visit JustMommies Cloth Diapering forum for more information on cloth diapering.